Patients will need to bring a physician’s order to the initial appointment. If your physician is directly faxing the order to our clinic, please let us know. If your health insurance is covering the cost of therapy, you will need to bring your insurance card. If you are covered by more than one insurance provider, you will need to bring cards for all providers. If Medicare is covering the cost of therapy, you will need to provide your Medicare card. If you have Medicaid, you will need to provide a copy of your current Medicaid insurance card each month that you are receiving therapy. If your therapy is due to a worker’s compensation injury, you are required to bring your worker’s compensation claim number, authorization for treatment and case manager contact information. If your therapy is due to an injury sustained in an auto accident or is going to be funded by an attorney lien, please bring that information with you, including the accident report, auto insurance information and/or attorney information if applicable. Do I need a referral from my doctor for therapy? No, you do not need to have a referral from your physician to receive therapy. However, many insurance plans require a physician referral. Medicare and Midland's Choice are examples. It is recommended that you contact your insurance company via the phone number listed on your insurance card to find out whether or not a physician order is required for therapy benefits. The order will only be valid for 30 days from the date that it is written, so it is important to schedule your first therapy appointment within that 30-day time frame. If you have Medicare coverage, you will need a referral from your physician for therapy. A referral from a healthcare professional other than a medical doctor, such as chiropractor or dentist, will not be accepted by Medicare. What happens at my first therapy appointment? You should arrive to your appointment 15 minutes prior to your scheduled appointment time. You will need to complete the admission paperwork prior to your appointment. You will need to present your insurance card(s) and your order for therapy or other payer information if work comp or auto. A therapist will complete a therapy evaluation. This evaluation will include discussion of medical history, current medications, diagnosis, function and pain limitations, as well as goals for therapy. In addition, your therapist will perform an objective evaluation that will assist with developing a treatment program that will allow you to meet your therapy goals and return to your normal function. How much time should I plan for each therapy appointment? Your initial evaluation will last approximately one hour, with subsequent visits lasting 30 minutes to an hour. Once your initial evaluation is complete, your therapist will be able to provide you a more accurate time frame for additional therapy visits. What should I wear for therapy? Land-based therapy: Comfortable clothing is recommended. It is best to wear loose fitting clothing, such as shorts or sweatpants for lower extremity problems and a tank top or a loose fitting shirt for upper extremity/torso problems. It is also recommended that you bring or wear tennis shoes. Aquatic therapy: You will need to wear a swimsuit or dark colored T-shirt and shorts (hemmed, no cutoffs) and pool shoes that have not been worn outside or in lake water. Towels are provided. There are places to change with lockers to store your personal items, and it is recommended that you bring a lock to secure your items in the locker. The lockers are for day use only. Will I be able to schedule appointments around my work schedule? Yes, we have convenient locations and offer early morning and evening appointments. Please review our therapy locations and hours to determine which facility will best suit your scheduling needs. How many therapy visits will I need? This is based on your diagnosis and the complexity of your symptoms. Your therapy could last as little as one visit or it could last for several months. Your therapist will periodically reevaluate your progress and provide recommendations to you and your physician as to your continued therapy. How will my doctor know how I'm doing in therapy? Your therapist will provide your doctor with a report from your first therapy visit. This report will include the results of your evaluation, treatment plan and goals for therapy. In addition, your therapist will provide your doctor progress reports throughout your therapy program, ensuring up to date information regarding your therapy progress and status. Should I ask my doctor if I need therapy? It is a good idea to discuss whether or not therapy is right for you. If your doctor has questions or would like to contact us regarding specific therapy treatments, he/she is welcome to contact any of our therapy offices. Is therapy covered by my insurance? Most health insurance companies will cover therapy costs; however, specific coverage may vary depending on specific diagnoses. You can visit our insurance link to view the insurance plans with which we currently participate. What is expected of me during therapy? How quickly you respond to therapy and get back to normal functioning is greatly dependent on you. Your participation and commitment with treatment and exercises provided by your therapist will ensure that you obtain the most from your therapy. To ensure success, you need to attend all scheduled appointments and perform any home exercises your therapist prescribes. Communication between you and your therapist is also important to your recovery. Once you are discharged from therapy, you may need to continue with a exercise program. This program may be able to be completed in your home or may be better suited for a fitness center setting. Madonna TherapyPlus offers the Structured Independence Program or the TherapyPlus Aftercare program to provide a setting in which you can perform these exercises. You have the right to choose where to go for therapy. Madonna TherapyPlus is committed to providing top notch patient care for outpatients. TherapyPlus offers three convenient locations throughout Lincoln and one location in Omaha. Each location offers one-on-one therapy appointments with a clinician, extended hours and state-of-the-art equipment and technology. Our expert clinicians are highly trained and qualified and provide services that you cannot find in every clinic. TherapyPlus participates with most major insurance plans, including Medicare. It is your responsibility to pay any deductibles, co-payments, or co-insurance. In addition, you are also financially responsible for any services that are not covered by your particular health insurance plan. You are strongly urged to check with your insurance provider regarding specific therapy benefits prior to your initial visit. If your plan does include a co-payment for therapy services, we will collect your co-payment prior to each visit. Many insurance plans require a referral/order for therapy from your primary medical physician. If your insurance carrier is one that requires a physician referral, we ask that you contact your physician prior to your initial therapy visit to ensure full insurance benefit. If your health insurance information is not listed as one of our accepted insurance plans, we will work with your insurance provider to negotiate a single-case agreement. It will be your responsibility pay for any remaining amount due for your therapy. After Jan’s vehicle was t-boned at a busy intersection last June, a catscan didn’t indicate an issue. But she could no longer spell her name after a few days of rest. With her daughter’s wedding just three weeks away, Jan reasoned her pain away hoping she’d improve. Unfortunately the night of the rehearsal dinner she struggled with debilitating headaches and was sensitive to sound at the wedding. Her family practice physician referred her to Madonna TherapyPlus for a concussion test which proved that her continual headache over her right eye was the result of a traumatic brain injury. “Dr. LaHolt made me feel supported, and Dr. Gates gave me the most thorough eye exam of my life,” said Jan, who soon began physical, speech, occupational therapies and neuropsychology services. Jan is now able to work and reinforces the skills she learned to successfully return to normal activities. A native of Nashville, TN, Andrea Zink moved to Lincoln, Nebraska three years ago while her husband Joshua worked on his doctorate in music. On February 26, 2015 their plans almost came to a halt after an auto accident on her way from a work meeting in Omaha, which left her with extensive injuries. At 70 mph on the interstate, her sport utility vehicle collided into the back end of a box truck that was driving about 50 mph when a lane change occurred. Andrea does not recall the impact; just waking up at Creighton University Medical Center, where she remained for two and a half months. She had severely broken her left arm, both femurs, tibia and fibula, and her right ankle. Andrea also had internal injuries to her intestinal tract/colon, a liver contusion, plus a pancreatic duct injury was discovered later. She had also broken the talus bone in her foot, which initially led doctors to consider amputation, but that outcome was averted by an all night surgery the day of the accident. 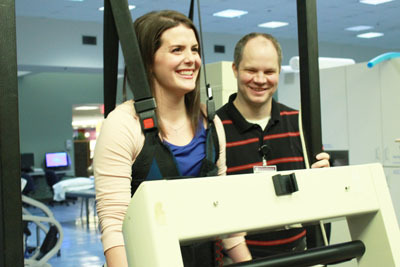 A bright spot in her recovery came about a week before her discharge from Creighton. “I could not eat solid food for 48 days, so eating food again was amazing, and I knew exactly what I wanted,” said Andrea. As an excellent cook, her husband cooked up her favorite Thai dish as soon as she was able to consume food again. “I appreciate the little victories and am stronger every day,” said Andrea. “It feels great to get out and do some regular activities. I even tried wheelchair tennis." She continues to celebrate accomplishments, like being recently cleared to drive and returning to her work as Special Events Manager at the Omaha Kroc Center. Dee Ann Unruh of Auburn, Nebraska, drives 70 miles each way three times a week to exercise in Madonna ProActive’s aqua track. She credits aqua therapy for helping her walk again after being immobilized by rheumatoid arthritis, an autoimmune disease that causes chronic inflammation of the joints and other areas of the body. Dee Ann, just 52 years old now, has had the disease for 11 years. After injuring her back from a fall in December of 2012, she developed spinal stenosis, a disorder caused by the narrowing of the spinal canal. Between that and bulging discs, mild scoliosis and general inflammation from rheumatoid arthritis, she became dependent on her husband’s assistance to get dressed, eat and shower as her condition worsened. By the fall of 2014, Dee Ann was unable to walk without the assistance of a walker. Her prayers were answered last December during an appointment at the Nebraska Spine and Pain Center in Lincoln. Unable to be seen by her doctor that day, a physician’s assistant recommended that Dee Ann consider trying aqua therapy at the Madonna TherapyPlus location within ProActive. Anxious to find any relief from the debilitating pain she experienced, she scheduled an appointment shortly before Christmas. “Water gave me relief from pain,” said Dee Ann of her first visit. Her heart soared with encouragement and hope. By the end January Dee Ann was able to be weaned off of the walker, and by March, the shower seat she depended on just months before, was put in storage. “Physical therapy has been so successful that I am not facing surgery. I joined ProActive after finishing my therapy sessions because I did not want to give this great place up,” said Dee Ann. While she has reduced her hours as a guest services agent at the Omaha Henry Doorly Zoo, Dee Ann has maintained employment and improved her quality of life. Sandy was in relatively good health in 2006 when she joined ProActive, but would often experience muscle tension in her neck, shoulders and chest which resulted in pain, spasms and involuntary movement. She had difficulty maintaining stamina to get through workouts and her daily activities were compromised. Numerous doctors and specialists have been unable to determine a diagnosis since. “About five years ago, I was referred to Madonna TherapyPlus at ProActive and began aquatic therapy sessions. I received personalized care and established an immediate bond with my therapist, Melissa. She is knowledgeable and determined, and encouraged me beyond what I felt I could accomplish.” After the prescribed sessions were completed, Sandy was given a program to maintain what she achieved and was encouraged to encouraged to consistently complete her exercises on a regular basis in order to maintain her improvement. She has followed that regimen almost every day since and has continued to see progress. Fidan, a 14-year-old ranked tennis star, tore her ACL this past summer during a competitive tournament. Post surgery she worried that her future in the sport was compromised, but physical therapy at TherapyPlus has improved her outlook. Currently ranked 22nd in the Missouri Valley conference, Fidan will soon be back on the tennis court to compete once again. Fidan described her situation and experiences at Madonna TherapyPlus. Late July, after I had just returned from a trip down to John Newcombes Tennis Ranch, I had a tournament to play in. I was in the finals and was playing great, but then my worst nightmare occurred. As I was running for a short backhand, I could feel my leg start giving out and it felt like my leg was separating in half. I definitely knew something was wrong but had no idea what had happened. I later found out that I tore my ACL. I had my surgery performed by Dr. Strasburger. Two days after surgery I had my first physical therapy session at Madonna TherapyPlus. There I had met Chris, and on the first day we clicked. I also worked with other therapists -Kelly, Ryan, and Doug- that were also great. The service at Madonna provided great support. They are really nice and really know what they're doing. They have helped me build my knee back to like it was so that I can come back to tennis stronger. In the midst of training for the Lincoln Marathon, Julie injured herself while out on a run. After attempting to recover on her own, she realized she needed to seek out therapy. As a member of ProActive, she was familiar with the staff at the TherapyPlus location on-site. 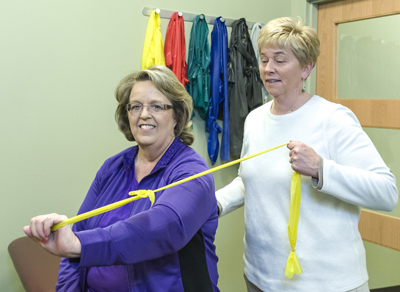 “My physical therapist was highly skilled in the therapy she provided, while being very motivating and uplifting to address the "psychological slump" of being injured,” said Julie. In a short amount of time, she was back out there, experiencing no pain, and even took some time off her personal record.